Italian carmaker Fiat has reported a 19% drop in revenues for the last three months of 2008, as its sales fell due to the global economic slowdown. Its revenues across the Fiat, Lancia, Alfa Romeo, Maserati and Ferrari brands totalled 6.3bn euros ($8.2bn; £5.9bn) during the quarter. This compares with 7.8bn euros for the same period last year. Trading profit across its car operations fell 44%. Fiat's results came as the government said it would study help for carmakers. Prime Minister Silvio Berlusconi said the government would meet next week to discuss the issue. Fiat said trading profit at its car operations totalled 202m euros in the fourth quarter, down from 360m euros a year earlier. It did not release a net or pre-tax profit figure for its car businesses. Quarterly sales of its Fiat, Lancia and Alfa Romeo cars were down 25% compared with a year earlier. Total net quarterly profit across the wider Fiat Group, which also includes the manufacture of lorries, buses and agricultural equipment came to 180m euros during the quarter. This compared with 597m euros a year earlier. Debt levels across the Fiat Group rose to 5.9bn euros, which some analysts said was a concern. 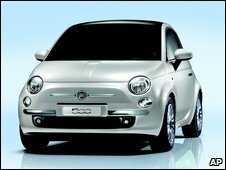 Earlier this week Fiat said it was entering into an alliance with US firm Chrysler.